Are Pepitas Good for the Prostate? 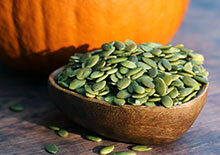 Pumpkin seeds are the edible olive-green seeds produced by pumpkins, a type of squash cultivar. Also known by their Spanish name "pepitas", the pumpkin and its seeds have been utilized for centuries by cultures of North and South America as a dietary food source and for their medicinal attributes. The pumpkin is believed to be one of the oldest domesticated squash species which occurred about 10,000 years ago in Oaxaca, Mexico. Evidence suggests that squashes like pumpkin were cultivated even before the two sister crops, maize and beans.